This week, residents of Bedford, Lexington and Weston were honored as members of the Massachusetts Commission on the Status of Women’s 2017 class of Unsung Heroines. Ann Guay, Alice Pierce and Pamela Fox were recognized as women who make a real difference in their neighborhoods and towns. BOSTON — State Senator Mike Barrett (D-Lexington) wants the Massachusetts Legislature to tell future presidential candidates that they cannot appear on a primary or general election ballot in the state until they release their tax returns and disclose potential conflicts of interests. BOSTON — The State Senate Committee on Post Audit and Oversight has completed a first-of-its-kind investigation of “fine time” in Massachusetts — the practice by district court judges of incarcerating defendants solely for failure to pay fines, fees or court costs. State Sen. Mike Barrett (D-Lexington), Chair of the Committee, called the findings “eye-opening.” He and Committee staff identified 105 instances of fine time in 2015 in just three Massachusetts counties — Essex, Plymouth and Worcester. In 60% of the cases, the defendant had at some point been verified as indigent; ten were described as unemployed; five, as homeless. Yet all 105 individuals were imprisoned for failure to pay fees and fines. To provide a measure of relief to Massachusetts job applicants, the State Senate has approved a bill, sponsored by State Senator Mike Barrett (D-Lexington), to restrict the use of credit reports in hiring and promotions. During recent Senate debate on the state budget, the body adopted several amendments offered by State Senator Mike Barrett, D-Lexington, to fund programs that assist people living in especially difficult circumstances. A report by the State Senate lambasts the process of setting Massachusetts home insurance rates and calls for immediate changes to state law to protect residents. In 2015 the Massachusetts Division of Insurance considered, and granted, requests by several of the state’s biggest insurers to raise their rates on homeowners coverage by as much as 9%. Yet neither the public, nor state legislators, nor insurance experts in the state Attorney General’s office, were informed of the requests. An initiative to reduce health disparities linked to race and ethnicity should be widened to include people with disabilities, according to experts and self-advocates who turned out en masse at the State House. A proposed new Office of Health Equity is directed explicitly to work in tandem with the existing Massachusetts Health Disparities Council, already tasked with a three-part focus on race, ethnicity and disability. Yet recent legislative action, little noticed, seeks to exclude people with disabilities from the scope of the new Office, de-aligning its mission from that of the Council. The State Senate has passed a bill to close the wage gap between men and women workers in Massachusetts. The legislation, which passed unanimously, mandates equal pay for comparable work, boosts wage transparency and requires the hiring process to be fair. Women comprise almost half the state’s workforce, but earn roughly 82% of what men make. African American women earn 66 cents for every dollar made by male workers; Latina women only 54 cents. Bicyclists from around Massachusetts gathered at the State House recently to call for new road safety measures to prevent traffic injuries and deaths. One of the bills before the Transportation Committee sets a minimum distance for cars to pass bicyclists; another aims to stop cars from blocking bike lanes. Both pieces of legislation are authored by State Senator Will Brownsberger, D-Belmont, and backed by local State Senator Mike Barrett, D-Lexington. 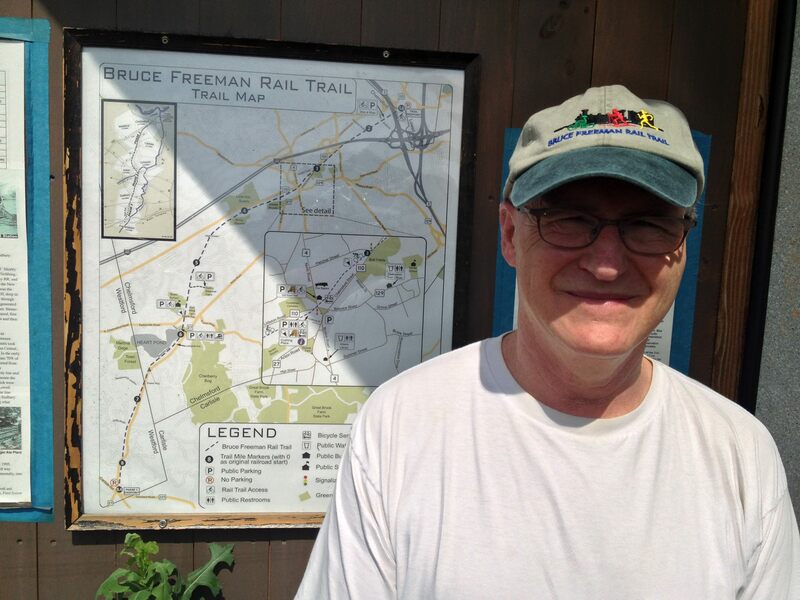 Barrett, a committed cyclist, is a longtime supporter of the Bruce Freeman Rail Trail and other pathways across his district. He says the Legislature should act on bike safety now. January 1st brought a measure of relief for many working families in Massachusetts. The state minimum wage bumped up to $10 per hour and the state Earned Income Tax Credit grew by more than 50%. 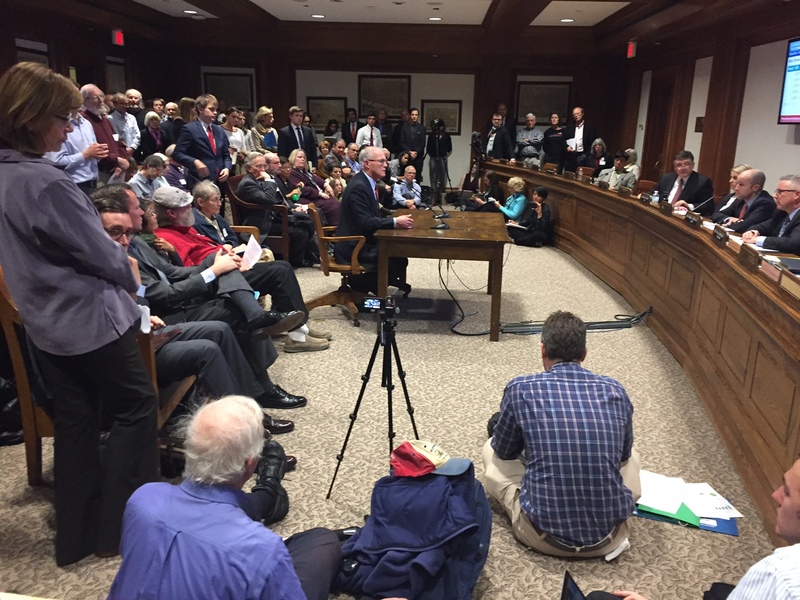 Boston – Inside a packed State House hearing room, businesspeople, economists, faith leaders, civic groups and concerned citizens pushed for a ground-breaking proposal to tackle global warming. The standing-room only crowd urged the legislative committee to approve S.1747, An Act combating climate change, filed by State Senator Mike Barrett, D-Lexington. The bill places a charge on dirty fuel emissions that contribute to global warming and then returns the money — in direct rebates — to residents, businesses and non-profits. Sen. Barrett testifies on carbon pricing at a packed committee hearing. A bill before the State Legislature aims to establish a Homeless Bill of Rights for Massachusetts. The proposal outlines seven fundamental rights for people experiencing homelessness, including the right to move freely in public spaces, to equal treatment by government agencies, to emergency medical care, and to vote. At a recent public hearing, advocates urged the Legislature’s Housing Committee to move the bill forward. Boston – Ride-hailing services Uber and Lyft were at the center of a recent State House hearing. With passions riding high on both sides, State Senator Mike Barrett, D-Lexington, says he wants to make sure the needs of people with disabilities aren’t left out of the conversation. Boston — Responding to recent Division of Insurance approvals of big hikes in home insurance rates, the State Senate’s oversight body is launching an inquiry into the increases. State Senator Mike Barrett (D-Lexington), Chair of the Senate Post Audit and Oversight Committee, says he wants to hear explanations from insurance executives and Division of Insurance regulators, and comments from consumer advocates. 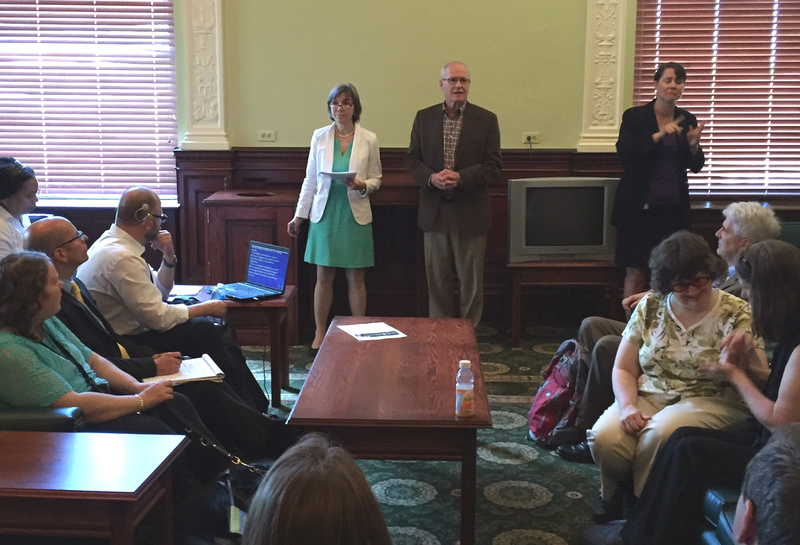 In concert with activists and advocates, State Senator Mike Barrett, D-Lexington, and State Representative Denise Provost, D-Somerville, recently launched a Disabilities Caucus within the Massachusetts Legislature. The inaugural event took place at the State House. State Sen. Mike Barrett, D-Lexington, and State Rep. Denise Provost, D-Somerville, give opening remarks at the kick off event for the newly-formed Disabilities Caucus. State Senator Mike Barrett, D-Lexington, is supporting a new “right to dry” for Massachusetts residents. His bill would extend the right to hang laundry on clotheslines to all state residents. Barrett introduced the legislation at the initiative of environmental activist Peggy Brace, a constituent from Concord. He recently testified in favor of the idea at a public hearing at the State House. Advocates packed the State House recently to back legislation to reduce the length of prison sentences for a host of drug-related offenses. State Senator Mike Barrett, D-Lexington, supports the reforms, calling excessive prison terms a “huge drain of taxpayer dollars” with “no added deterrent effect” on those eventually released. Massachusetts spends more than $46,000 per year to imprison each non-violent offender, many of whom have mental health and substance abuse problems. Oftentimes, Barrett says, they should instead be in treatment clinics where they can get help, an alternative that is not only more effective but costs less money.